Within hours, news of the discovery had reached the rest of the world. Television news anchors solemnly informed their audiences that the Loch Ness Monster had been found, but was dead. Reporters rushed to the loch to get more details. Other witnesses told reporters the creature had been between 12 and 18 feet in length and must have weighed up to 1½ tons. They said it had a green body without scales and was like a cross between a walrus and a seal. Eventually reporters contacted Don Robinson, Director of the Flamingo Park Zoo, who said, "I've always been skeptical about the Loch Ness Monster, but this is definitely a monster, no doubt about that. From the reports I've had, no one has ever seen anything like it before... a fishy, scaly body with a massive head and big protruding teeth." The next morning, April 1, the discovery made front-page headlines around the world. The British press dubbed the creature "Son of Nessie." Meanwhile, the creature itself was no longer at the Loch. After dragging the carcass back to the shore, the scientists from the Flamingo Park Zoo had sent a telegram to their boss, Don Robinson, and had then quickly loaded the body into their truck and taken off, intending to transport the monster back to the zoo for study. Mrs. Margrete Good, manager of the hotel, later told the press, "The zoologists were thrilled to bits." But when the local Inverness police heard that the scientists had hightailed it with the Loch Ness Monster, they were infuriated. These were English scientists, after all, removing Scotland's most famous lake monster — upon which depended a vast, lucrative tourist trade. Sirens wailing, police cars sped off. They soon caught up with the team of scientists. The frightened zoologists readily cooperated with the police, pulling over to the side of the road, and then opening the back of the truck to show the officers what they were carrying. Sure enough, according to the subsequent police report, lying inside the truck was a large "green and scaly" creature. In Dunfermline, the police searched around for an appropriate scientist to examine the creature, and eventually persuaded Michael Rushton, general curator of the Edinburgh Zoo, to come up and look at it. Shields explained that an expedition to the Falkland Islands had recently brought the seal back to the UK. It had lived briefly at the Dudley Zoo, but died soon after arrival. When he learned of this, Shields realized it offered an opportunity to prank his colleagues, who he knew were going up to Loch Ness to search for the monster. Shields gained possession of the elephant seal, shaved off its whiskers, padded its cheeks with stones, and kept it frozen for a week. Then he dumped it in the Loch and phoned in a tip to make sure his colleagues found it. He timed the prank so that news of the discovery of the Loch Ness Monster would make headlines on April 1 — April Fool's Day, which happened to also be his 23rd birthday. Shields admitted the joke got out of hand when his colleagues decided to remove the dead animal from Loch Ness and were chased down by the police. Police Superintendent Inas McKay of Inverness gave the press the final, official verdict on the incident: "It's just an April Fool's Day joke." But this wasn't quite the end of the story. The prank turned out to have unintended consequences for other visitors to the loch. Two weeks later, 28-year-old Norman Slater, a school teacher from Kenosha, Wisconsin, went on a fishing trip on the Loch. While floating along, he dipped his hand into the water. He later said that, as soon as he did so, he detected, by means of his extrasensory perception, the presence of six large creatures in the water — a family of Loch Ness Monsters. But Slater was a victim of bad timing. He complained that, despite the obvious scientific importance of his vision, because of the recent April 1st prank he couldn't find any reporters willing to take him seriously. "April Fool Joke On Loch Ness Misfires," (Apr 2, 1972), The Modesto Bee: A-4. "Green and Scaly Monster Hauled Out of Loch Ness," (Apr. 1, 1972), Los Angeles Times: 2. "Uses ESP: Detects family of Loch Ness monsters," (Apr 20, 1972). Manitowoc Herald-Times: 4-T.
"A real Loch Ness Monster Discovered?" (Apr 1, 1972), The Eureka Times-Standard: 2. 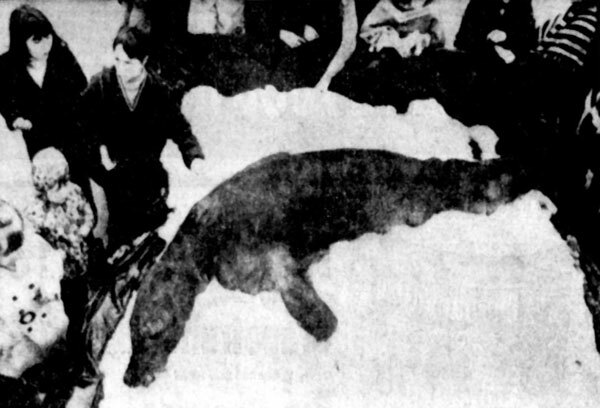 "Dead Loch Ness monster just so much bull seal," (Apr 1, 1972), Long Beach Independent Press-Telegram: A-18. "Loch Ness Finally Yields a Monster," (Apr 1, 1972), Utica Daily Press: 1.